In April 1463, he embarked with queen Margaret, prince Edward, and many persons of distinction, who followed the fortunes of the house of Lancaster, at Hamburg, and landed at Sluys in Flanders; whence they were conducted to Bruges, thence to Lisle, and thence into Lorrain. lu this exile he remained for many years, retiring from place to place, as the necessities of the royal family required: for though, during that space, the queen and prince were often in motion, and great efforts were made to restore. 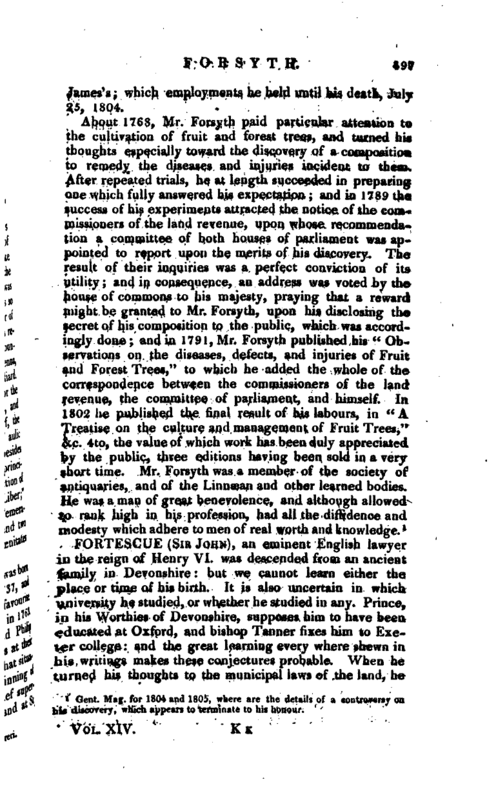 Henry, yet, considering the age of Fortescue, it i* not probable that he was suffered to expose himself to such hazards; especially as he might do them better service by soliciting their interest at different courts. 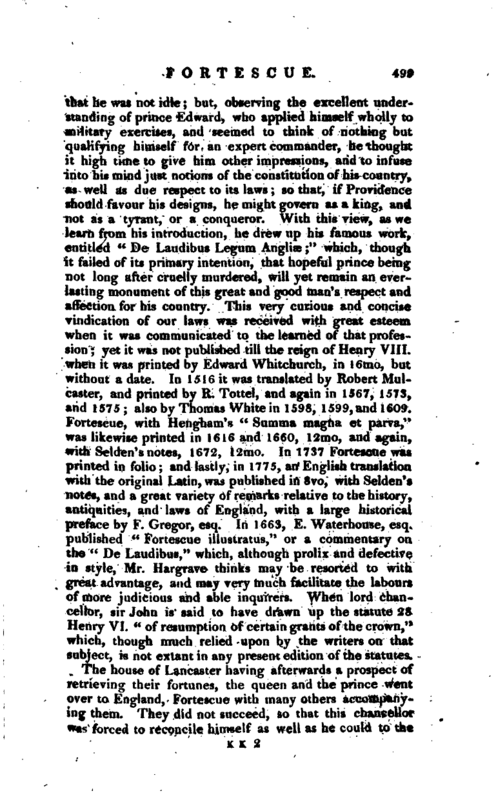 It is certain, | that he was not idle; but, observing the excellent understanding of prince Edward, who applied himself wholly to military exercises, and seemed to think of nothing but qualifying himself for an expert commander, he thought it high time to give him other impressions, and to infuse into his mind just notions of the constitution of his country, as well as due respect to its laws; so that, if Providence should favour his designs, he might govern as a king, and not as a tyrant, or a conqueror. With this view 1 as we learn from his introduction, he drew up his famous work, entitled “De Laudibus Legtirn Anglise;” which, though it failed of its primary intention, that hopeful prince being not long after cruelly murdered, will yet remain an everlasting monument of this great and good man’s respect and affection for his country. This very curious and concise vindication of our laws was received with great esteem when it was communicated to the learned of that profession; yet it was not published till the reign of Henry VIII. 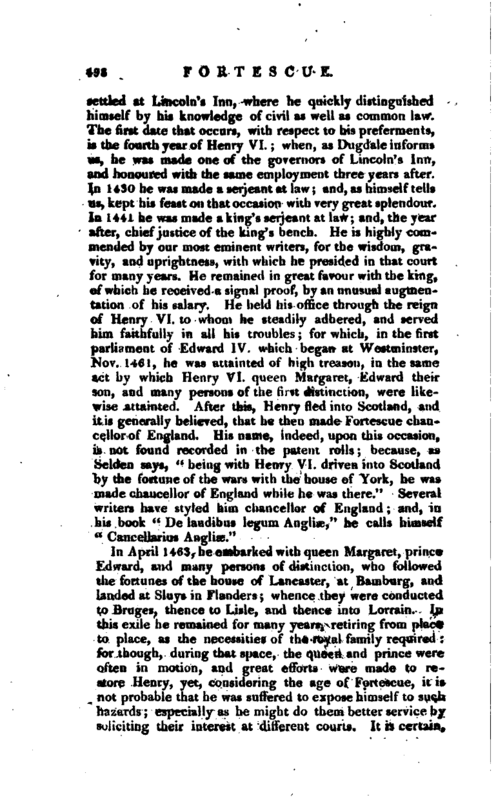 when it was printed hy Edward Whitchurch, in 16mo, but without a date. In 1516 it was translated by Robert Mulcaster, and printed by R. Tottel, and again in 1567, 1573, and 1575; also by Thomas White in 1598, 1599, and 1609. Fortescue, with HenghamVs “Summa magna et parva,” was likewise printed in 1616 and 1660, 12mo, and again, with Selden’s notes, 1672, 12mo. 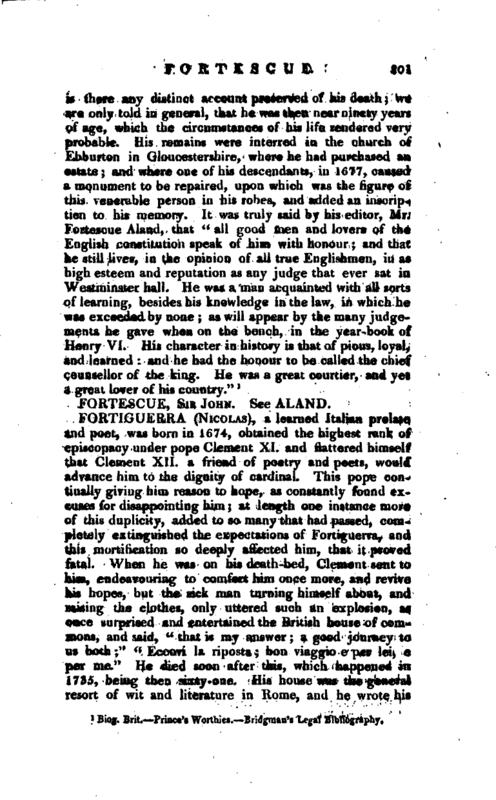 In 1737 Fortescue was printed in folio; and lastly, in 1775, an English translation with the original Latin, was published in 8vo, with Selden’s notes, and a great variety of remarks relative to the history, antiquities, and laws of England, with a large historical preface by F. Gregor, esq. In 1663, E. Waterhouse, esq. published “Fortescue illustratuV” a commentary on the “De Laudibus,” which, although prolix and defective in style, Mr. Hargrave thinks may be resorted to with great advantage, and may very much facilitate the labours of more judicious and able inquirers. When lord chancellor, sir John is said to have drawn up the statute 2$ Henry VI. “of resumption of certain grants of the crown,” which, though much relied upon by the writers on that subject, is not extant in any present edition of the statutes. The house of Lancaster having afterwards a prospect of retrieving their fortunes, the queen and the prince went over to England, Fortescue with many others accompanying them. They did not succeed, so that this chancellor was forced to reconcile himself as well as he could to the | victorious Edward IV. ; for which purpose he wrote a kind of apology for his own conduct. Tlws treatise, though it has never been published, Selden had seen; as he tells us in his preface to Fortescue‘ s book, “L)e Laudibus, <kc.” After all these extraordinary changes of masters and fortunes, he preserved his old principles in regard to the English constitution; as appears from another valuable and learned work, written by him in English, and published in the reign of queen Anne, with this title: “The difference between an absolute and limited monarchy, as it more particularly regards the English constitution: being a treatise written by sir John Fortescue, knight, lord chief justice, and lord high chancellor of England, under king ’Henry VI. Faithfully transcribed from the manuscript copy in the Bodleian library, and collated with three other manuscripts (which were afterwards printed). 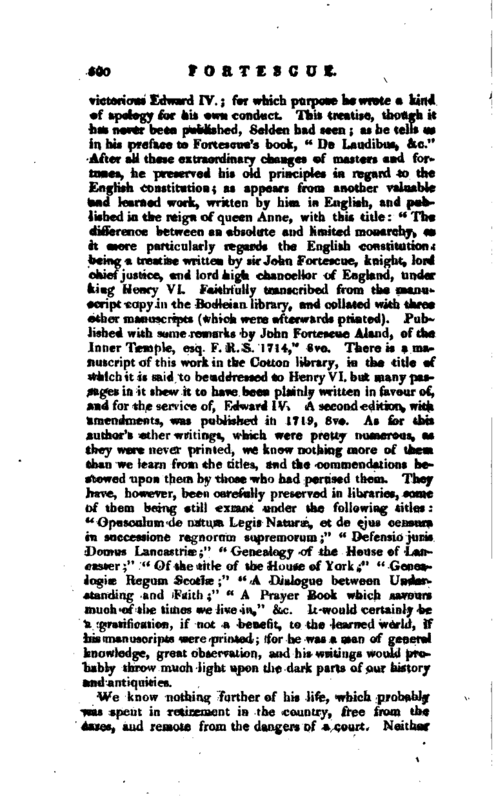 Published with some remarks by John Fortescue Aland, of the Inner Temple, esq. F. R. S. 1714,” 8vo. There is a manuscript of this work in the Cotton library, in the title of which it is said to be addressed to Henry VI. but many passages in it shew it to have been plainly written in favour of, and for the service of, Edward IV. A second edition, with amendments, was published in 1719, 8vo. As for this author’s other writings, which were pretty numerous, as they were never printed, we know nothing more of them than we learn from the titles, and the commendations bestowed upon them by those who had perused them. They have, however, been carefully preserved in libraries, some of them being still extant under the following titles “Opusculum de natura Legis Naturae, et de ejus censura in successione regnorum supremorum;” “Defensio juris Domus Lancastriae” “Genealogy of the House of Lancaster” “Of the title of the House of York” “Genealogise Ilegum Scotios” “A Dialogue between Understanding and Faith” "A Prayer Book which savours touch of the times we live in,' 1 &c. It would certainly be a gratification, if not a benefit, to the learned world, if his manuscripts were printed; for he was a man of general knowledge, great observation, and his writings would probably throw much light upon the dark parts of our history and antiquities.